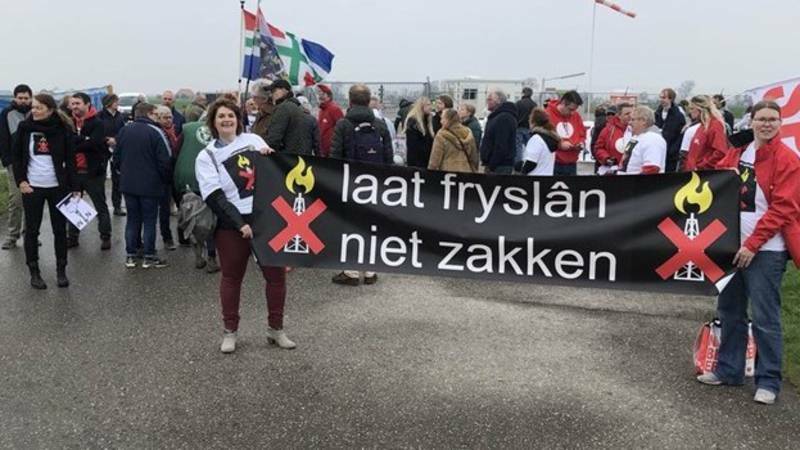 This photo shows today’s protest against fracking in Pieterzijl, a village on the border of Groningen and Friesland provinces. The banner says: Don’t let Friesland down. Behind it, the flag of Groningen province. 160 people live in Pieterzijl village. against the latest drilling site of the NAM. The NAM is a joint venture of Shell and Exxon Big Oil corporations. Their gas drilling has caused very much damage in Groningen and in Drenthe provinces. They are afraid of still more earthquakes and protest against gas extraction through fracking. In fracking, also called hydraulic cracking, gas is extracted from deep underground by adding chemicals.